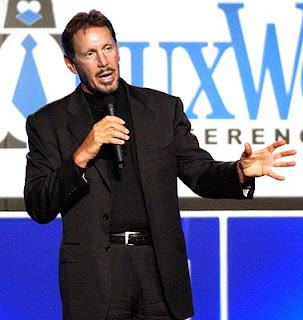 Database titan continues to engulf the competition; Oracle has racked up 49 acquisitions in the past four years. Bought BEA Systems for $8.5 billion last year. Company still sitting on $7 billion in cash. Revenues up 11% to $10.9 billion in the six months ended Nov. 30, 2007; profits also up 11% to $2.4 billion. Stock down 25% in past 12 months. Invested $125 million in Web software outfit Netsuite; took public in 2007, stock down 80% since. His shares are still worth $300 million. Chicago native studied physics at University of Chicago, didn't graduate. Started Oracle in 1977. Public in 1986, a day before Microsoft. Owns 453-foot Rising Sun; built a smaller leisure boat because the long yacht is hard to park. Squabbling in court with Swiss boating billionaire Ernesto Bertarelli over terms of next America's Cup. Recently unveiled hulking 90-foot trimaran he intends to use to win it.